Running along Lake Geneva is a real treat. There are wonderful paths along the lake on both the north shore (rive droite) and the south shore (rive gauche). 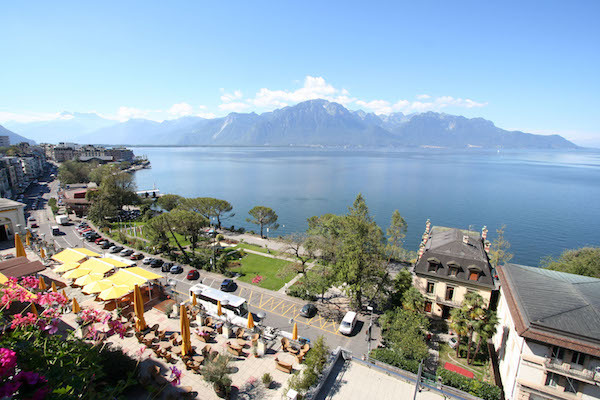 This route is along the north shore, featuring fantastic views of the lake and mountains, famed hotels along the water, parks, and a quick jaunt over to the Parque des Nations (UN Office Complex). We start downtown, at the Place de Rhone (or near any other bridge that crosses the Rhone). Cross over the pedestrian Pont des Bergues, to the lakeside path, paralleling the Quais de Mont-Blanc. Lovely buildings along the water here. After 1 km, reach the jetty, where there’s a public swimming pool & sauna. Soon after, there’s a lovely run through several parks, with the Museum of the History of Science on your left. At the 3 km mark, reach the Botanical Garden. For a shorter run, you can turn around here. We head through some of the nice garden paths, down to the Avenue de la Paix for a short jaunt into the Parque des Nations, which has sort of an ugly fence blocking the views but eventually you’ll see the main entrance to the UN, with its lines of flags. Across the street is the Place des Nations, and famous broken chair sculpture. You can add on a bit here by running through the paths of the Parque. For the return, retrace your steps.